The American Idol 2014 Top 7 finalists are revealed, but sadly, Fil-Am finalist Malaya Watson, one of the big favorites, is not included. Totally shocking! No one was voted off last week when Sam Woolf escaped elimination after he got saved by the judges. But for this week, there's one who's sure of being eliminated. C.J. Harris in the BOTTOM 2. 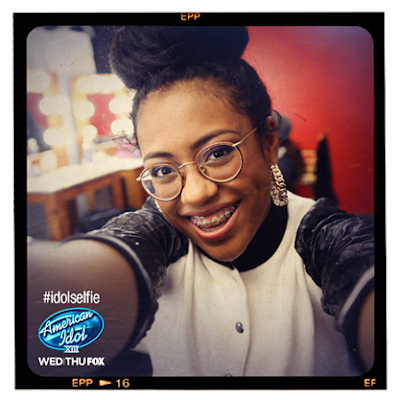 Malaya Watson in the BOTTOM 2. It's the 3rd time for Fil-Am Malaya Watson to be part of the bottom list, while a 2nd for wildcard C.J. Harris. And at the end of the show, it was announced that C.J. is safe and Malaya is goin' home. Sad to see Malaya leaving American Idol. If only the judges didn't use their "save" vote for Sam Woolf last week, then probably, they could have used it for Malaya. There are other finalists in the Top 7 who are vocally weaker than her. I am so sure the judges regretted using the save last week. Your fault judges!!! Since the Top 13 finals, Caleb, Jessica and Alex never made it to the bottom group. Shall we expect the American Idol 2014 winner to come from these 3? Not surprised, There really isn't any real favorites this year. Omg I like Alex, but he hasn't really inproved. Been voting but for CJ, also. This year is not a good year. Come On American Idol lets get this show Going. Whats going on?